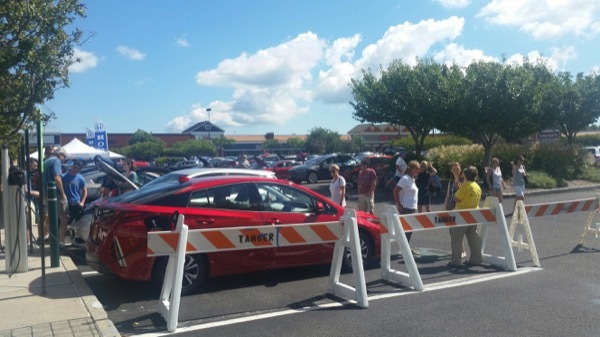 Warm temperatures in the low-80s and clear sunny skies helped make for a great day, as we celebrated our 7th Annual National Drive Electric Week event at the Tanger Outlets in Riverhead, NY on Sunday September 16. Approximately 250 people were on hand to see, sit in, ride/drive and to learn more about the 28 EVs & PHEVs brought to the event by proud vehicle owners, local dealerships, and our Long Island gas and electric utility. We had thirteen different models on display, which included 3 BMW I3s, 2 Chevy Bolts, 2 Chevy Volts, 2 Nissan Leafs, 2 Prius Primes, 2 Honda Clarities, 1 Kia Soul, 1 Fiat 500e, 1 Smart fortwo, 5 Tesla Model 3s, 2 Tesla Model X, 2 Tesla Model S and 1 Tesla Roadster. Five test drives/rides of the Clarity, Tesla Model S, Tesla Roadster, and Fiat 500e were given to potential future EV/PHEV owners. Some of the EVs & PHEVs on display at Tanger Outlets. At left a Red Prius Prime, White Nissan Leaf, Orange Smart Fortwo and Silver Chevy Volt are plugged in for charging. On the right are a Bronze BMW I3, Grey Tesla Model X, Red Tesla Model 3, Blue Tesla Model 3, Orange Fiat 500e, Green Tesla Roadster, and a Red Tesla Model S.
Join us on September 16 at Tanger 1 to see many of the electric and plug-in hybrid electric vehicles currently available in the greater NY market. Talk with enthusiastic vehicle owners to learn why they love their vehicles and/or with dealer representatives to understand the various features of the vehicles. Also find out how easy it is to re-charge vehicles. Attendees will also have an opportunity to ride in or drive one or more of the vehicles on display. Last year we had ten different models on display which included 3 Chevy Bolts, 4 Chevy Volts, 2 Nissan LEAFs, 1 Ford C-Max Energi, 1 Focus EV, 4 Kia Souls, 2 Prius Primes, 1 Fiat 500e, 7 Tesla Model S, and 1 Tesla Roadster. We hope to top those numbers this year! There are currently 93 attendees registered. Registered attendees report 594,433 electric miles driven.